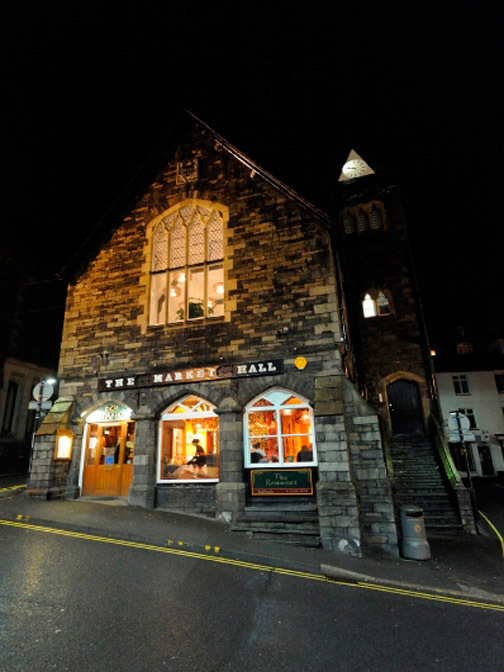 " Sherran, Bill and Angie in the Lakes "
Date & start time: Sat 30th Nov ~ Wed 4th Dec 2013. 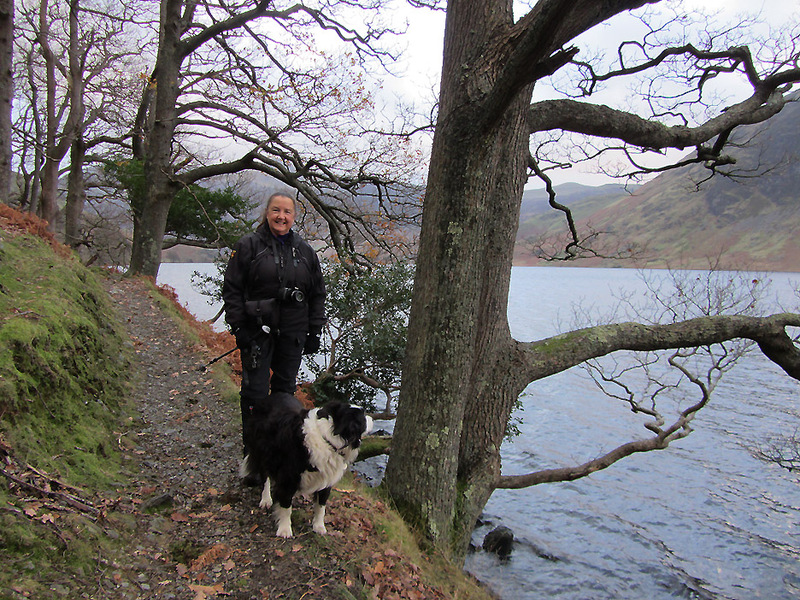 Places visited : Ambleside, Low Ling and then a Cinderdale walk to home. 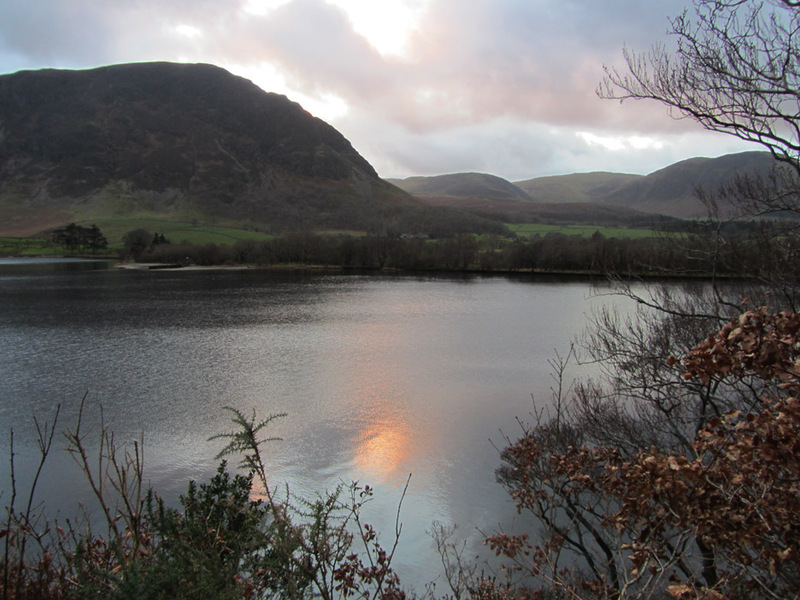 Walk details : 2.25 mls, negligible feet of ascent, 1 hours 20 mins. 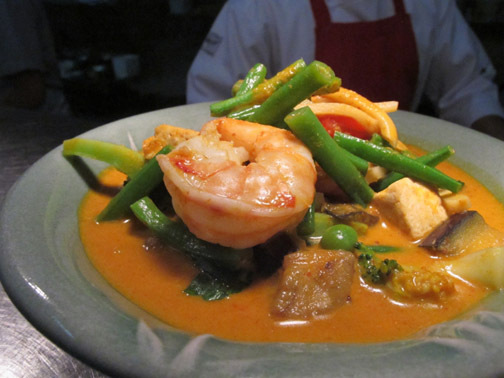 Highest point : A meal out at a new restaurant with friends. 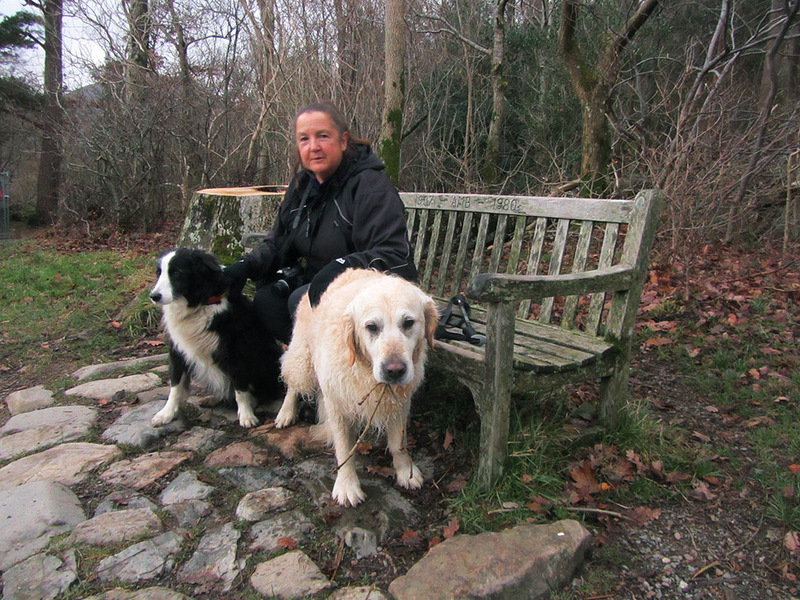 Walked with : Sherran, Bill, Angie, Ann and the dogs, Bailey and Harry. Weather : Inclement at times, better at others. 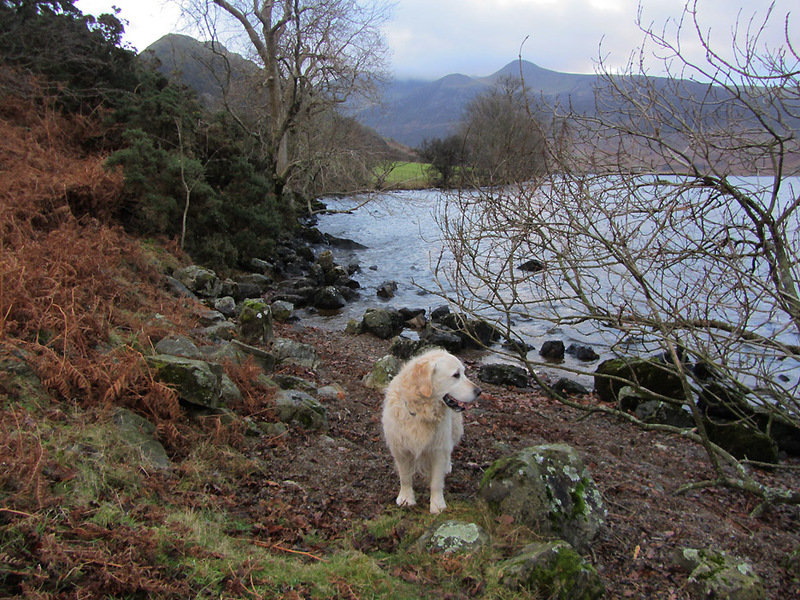 but we did manage a couple of nice walks and stayed dry most of the time. and enjoy a nice meal over there . . . which is where we'll head first . 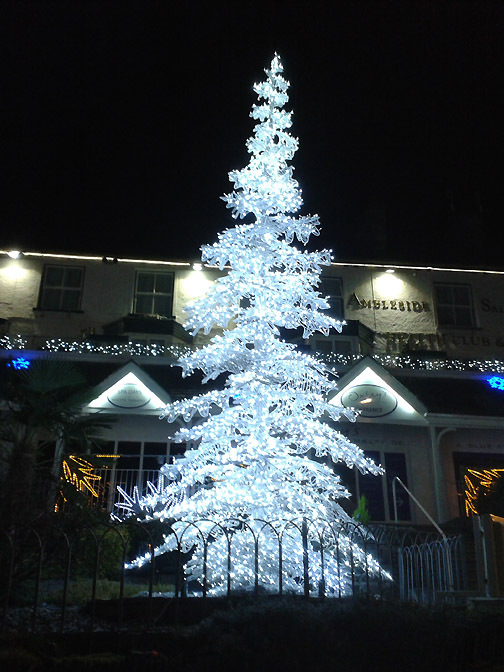 . .
A rather dramatic white Christmas tree at the Salutation Inn. 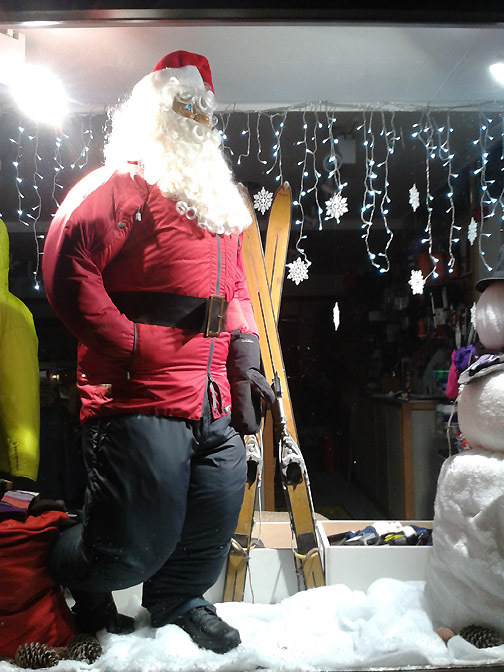 Santa's gone skiing after too many Christmas puddings perhaps ? at the Doi Intanon Thai Restaurant in Ambleside. 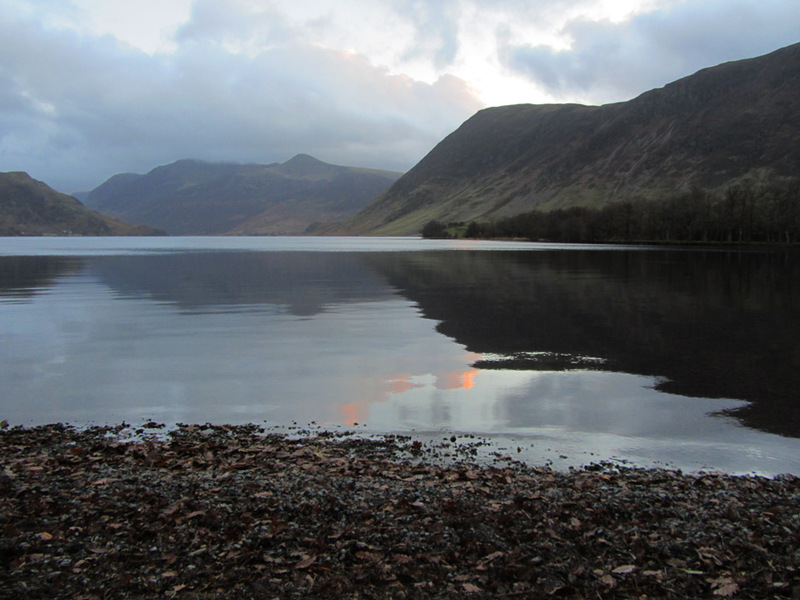 On Monday everyone came over to us for a walk out to Low Ling Crag on the southern side of Crummock Water. 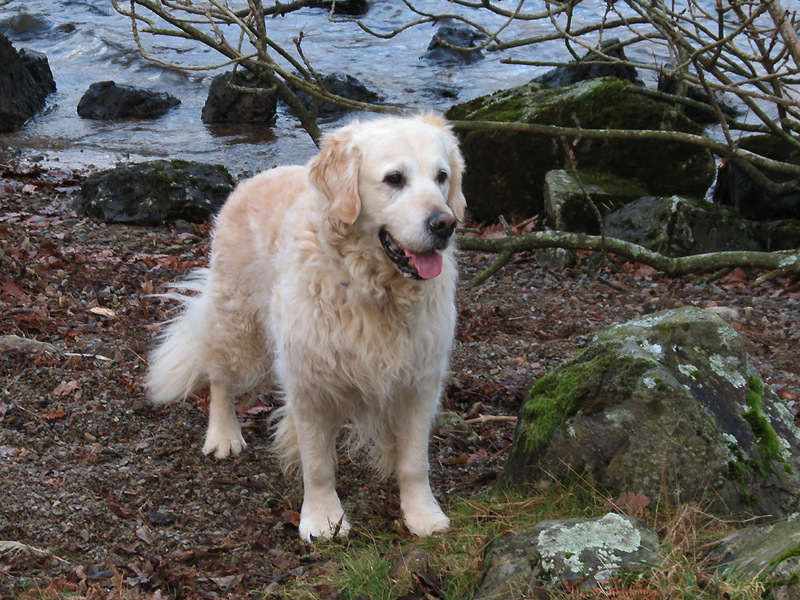 Angie's dog Bailey is 14 years old so the walk was more like a horizontal crossword . . . more 'acrosses' than 'ups and downs'. 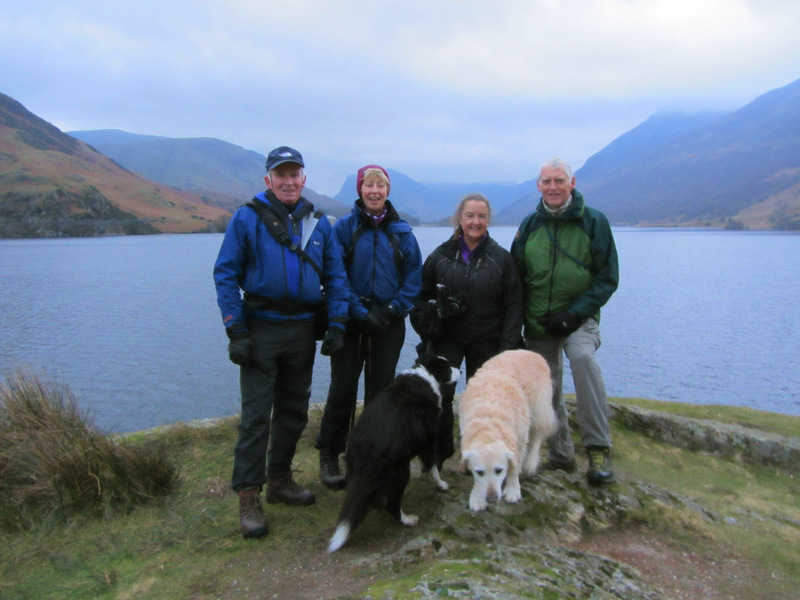 Bill, Sherran, Angie and myself out on Low Ling Crag (Ann took the photo) Front row : Bailey and Harry. 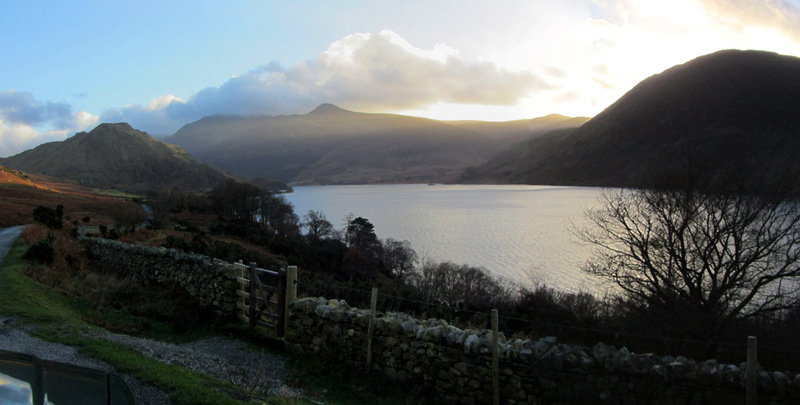 Whilst the walk was not wet, the thick summit clouds added an air of dampness to the day and an air of mistiness to the lens. 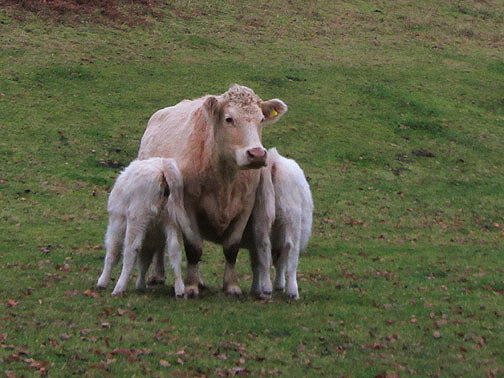 One of Chris's cattle still out with its calves . . .
. . . Elevenses at 3 in the afternoon ! while Bill and I adjourned to the Farmer's Discussion Group Monday meeting at the Kirkstile Inn. 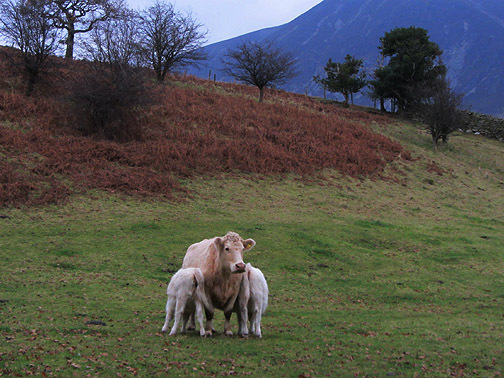 and with the influence of the local farming audience, the subject ranged widely to include badgers and bovine TB. taking up the offer of "B&B and evening meal" at Oak Cottage. 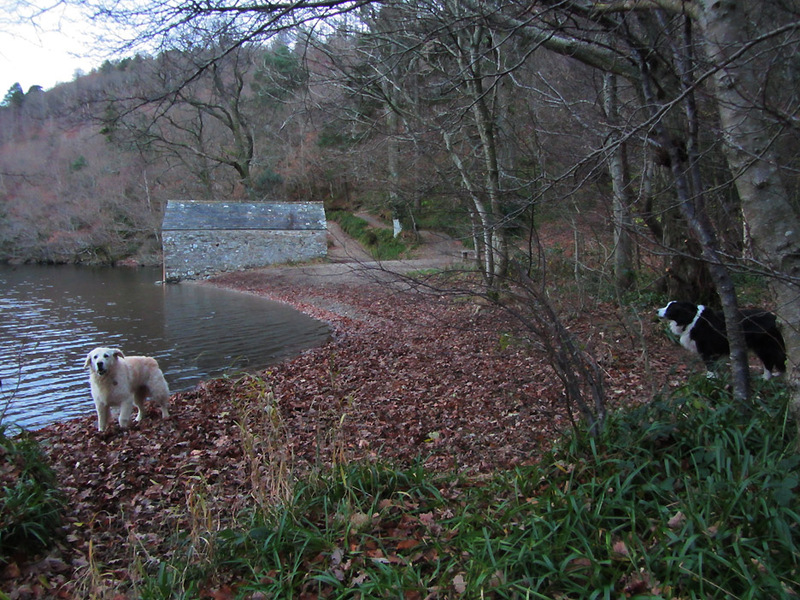 Wednesday, Harry had company for a walk . 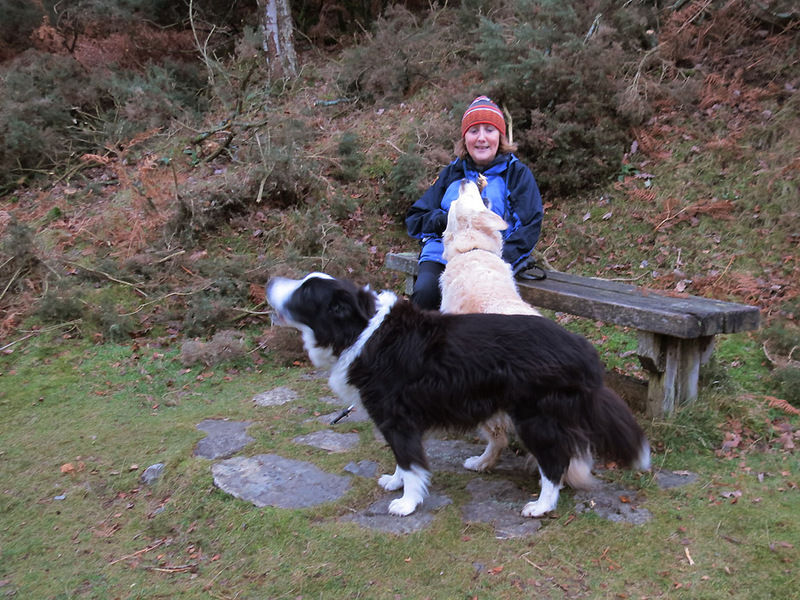 . .
today he had more four legged' company . 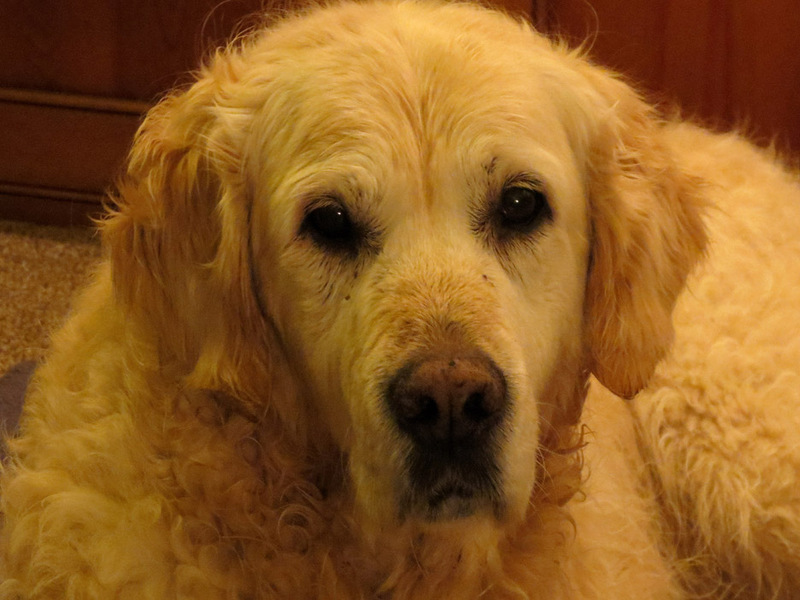 . . Angie's dog Bailey is an active 14 years old sheepdog. 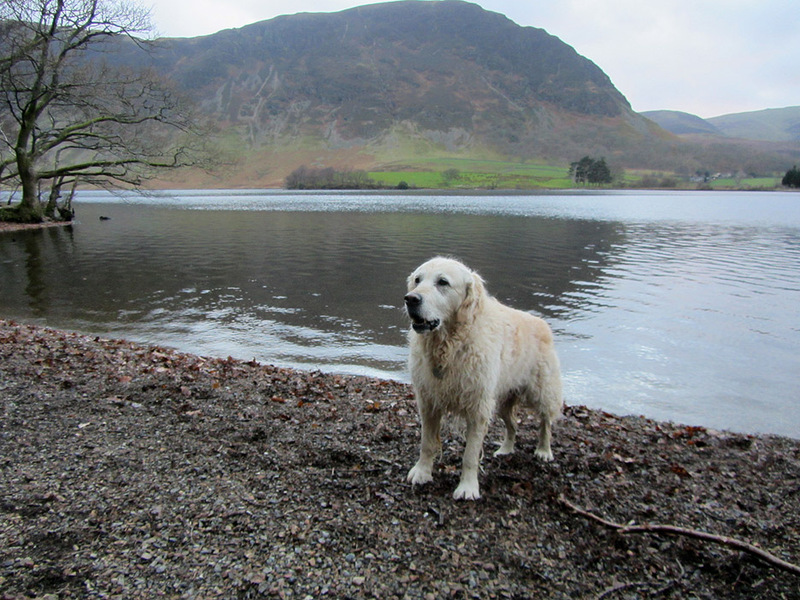 on the lakeside just before Rannerdale Knotts (centre picture). With the low winter sun, the lakeside path would be in shadow most of the way, but the afternoon was fine so that kept things bright. 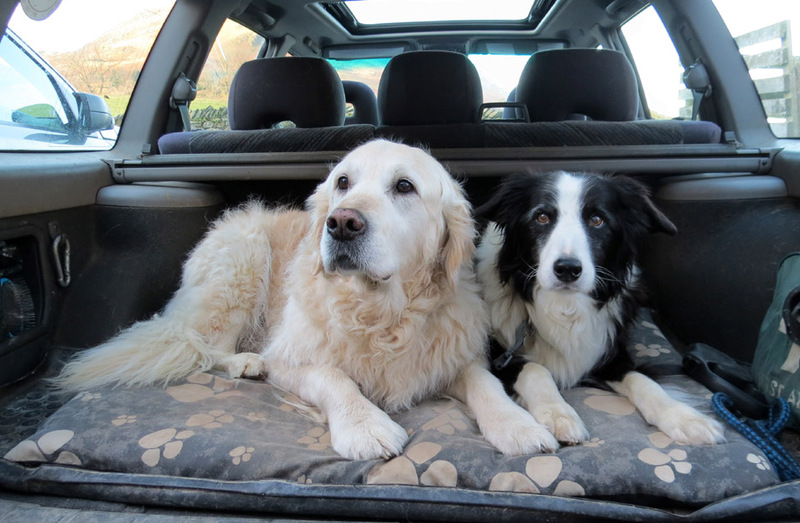 I dropped the two ladies off and returned home with the car . . . so all pictures now are Ann's or Angie's. 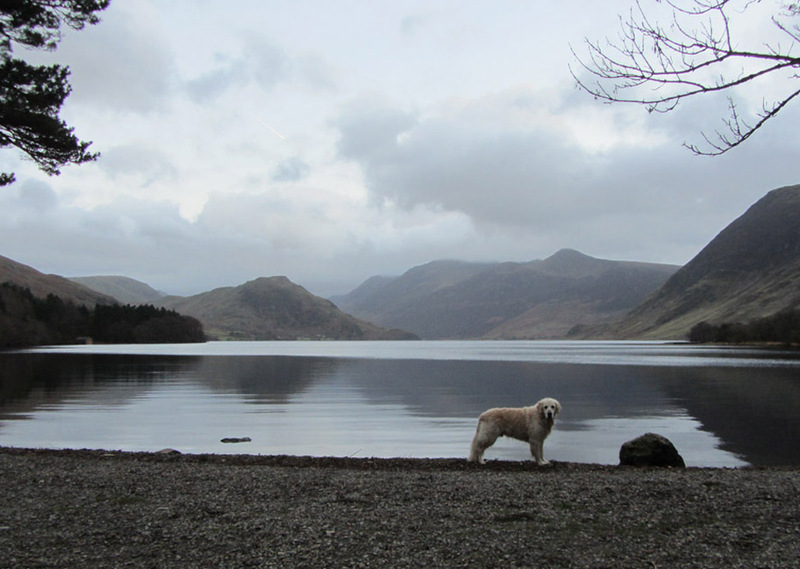 Harry by Crummock Water . 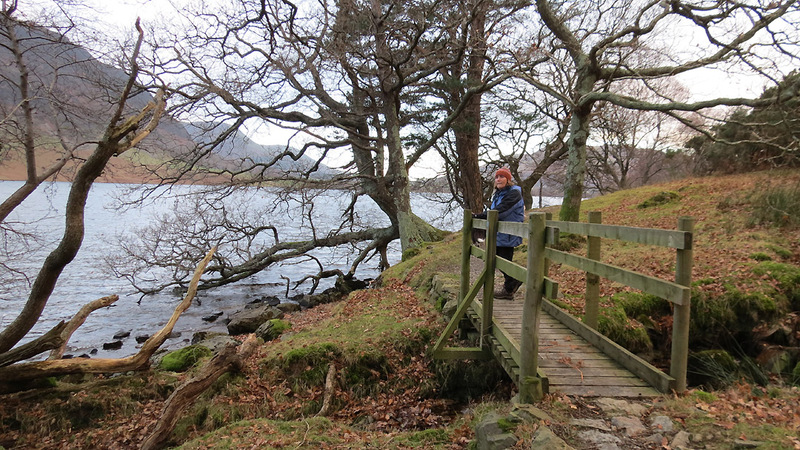 . . soon after the start of the path down the lake towards Lanthwaite Woods. Angie by Harry . . . I mean by Ann ! 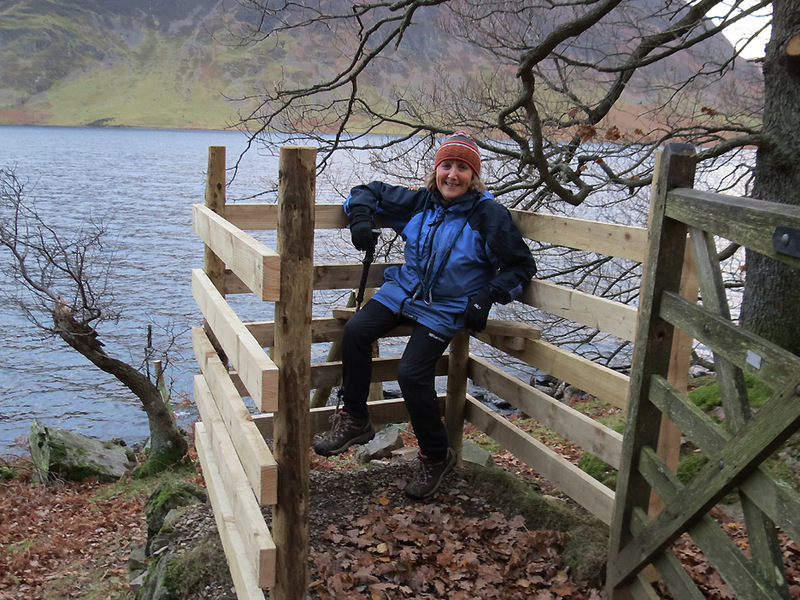 A recent refurbishment of this gate provided Ann with a corner seat and somewhere to rest her . . . walking pole. a good variety for a reasonably short walk. Another seat . . . this time a proper one . . . complete with talking dogs. 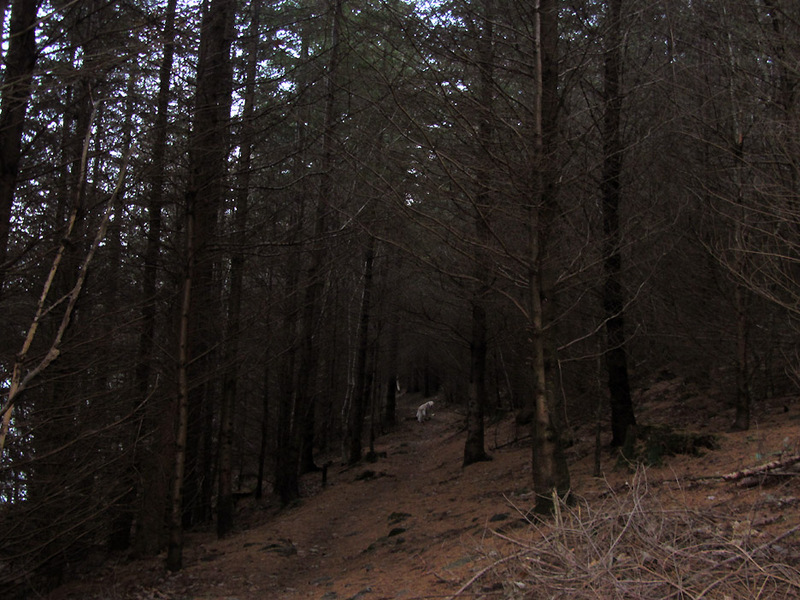 Known on the map as High Wood . . . 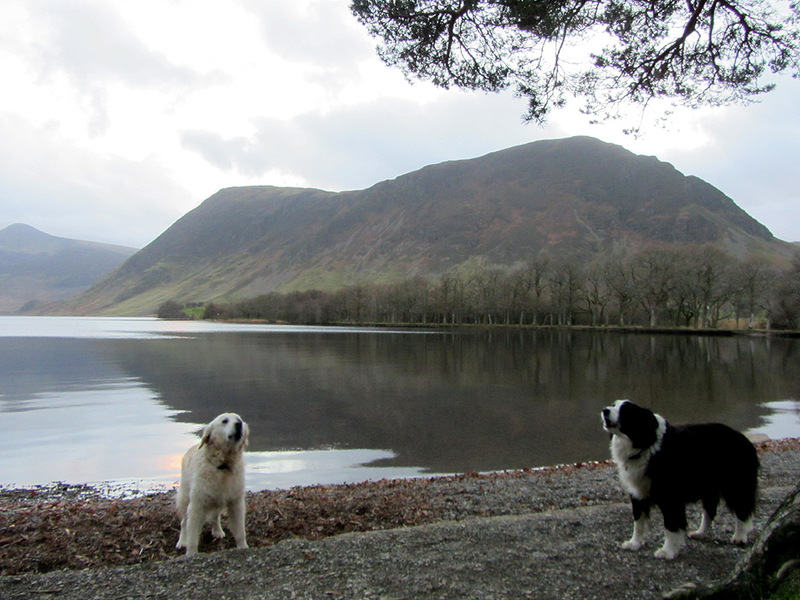 Known locally as that nice pine forest bit underneath Grasmoor, before you get to the boathouse. See what I mean ! 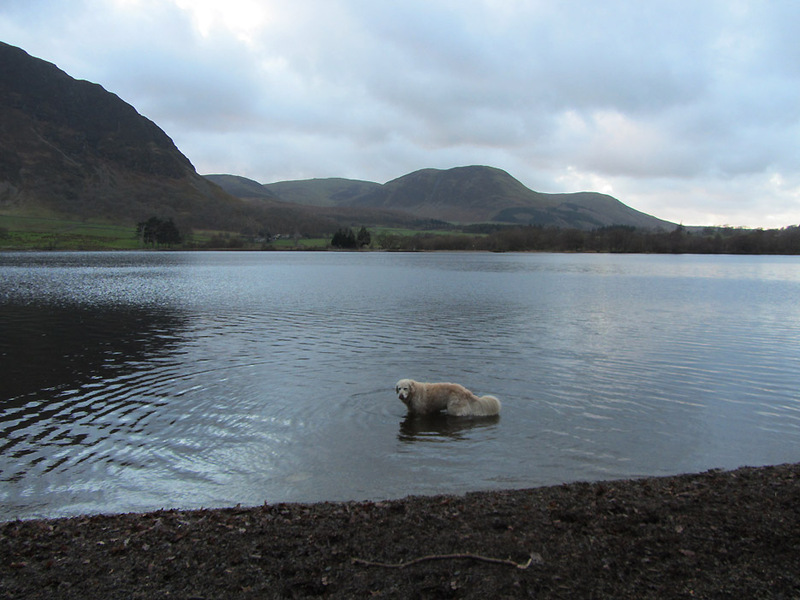 Harry enjoys a paddle and a play with sticks . 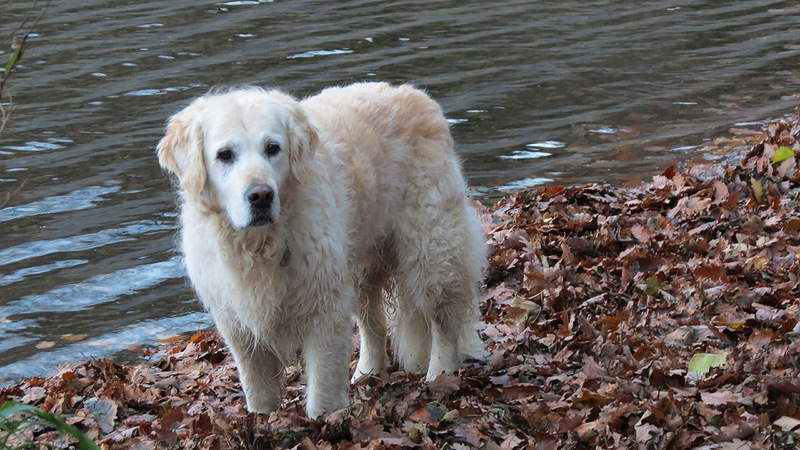 . . Bailey prefers to keep his paws dry.
" Throw me another one "
What's wrong with the one by your feet ? Heavy leaf-fall in the recent strong winds has left a tide-line of leaves a couple of feet wide . . . and a couple of inches deep. 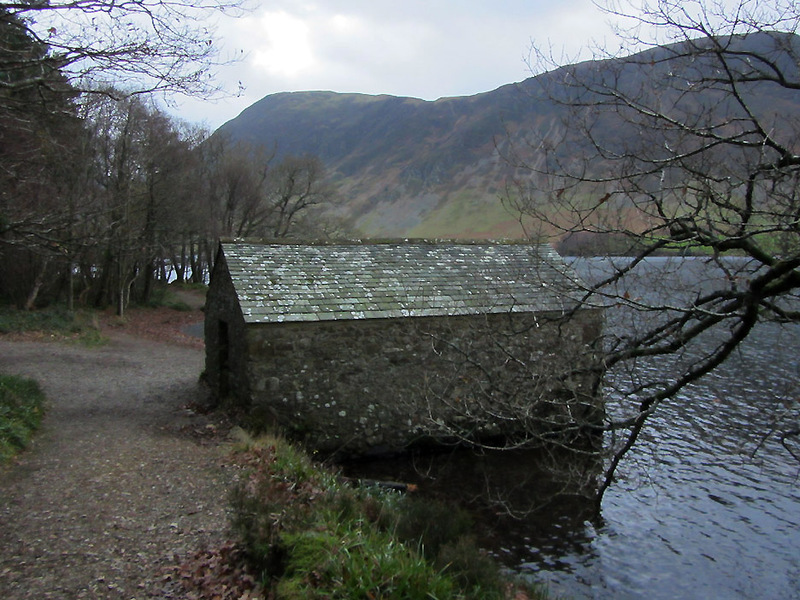 The old boathouse, now with posh new doors both ends. 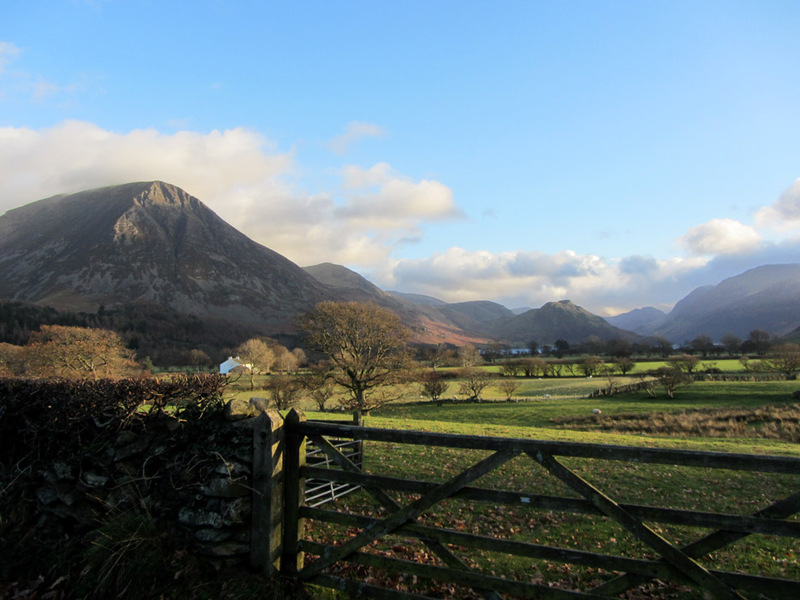 The late afternoon sun adds a little colour to the cloud over the western fells . . . and reflects nicely in the lake below. Down at the weir the water is calmer and the reflections better. More doggy "conversations of a stick nature". The seat is more open now as the large tree behind has been felled. Harry is never one to sit still for long . . .
hold your cursor over the picture to see what he wants to play with. 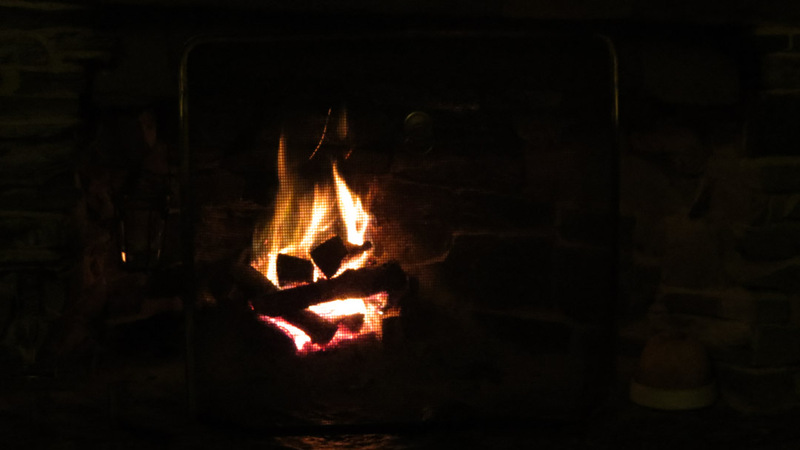 Back home and the fire is lit . . . the fireguard adding a touch of geometry to the warming flames. Harry under the spotlight . . . while I was trying out the nice zoom on Angie's camera. Technical note: Pictures taken with either Ann's Canon Sureshot SX220, or Angie's Canon SX 40 HS digital 'bridge' camera. This site best viewed with . . . someone else to add a few nice photos too.